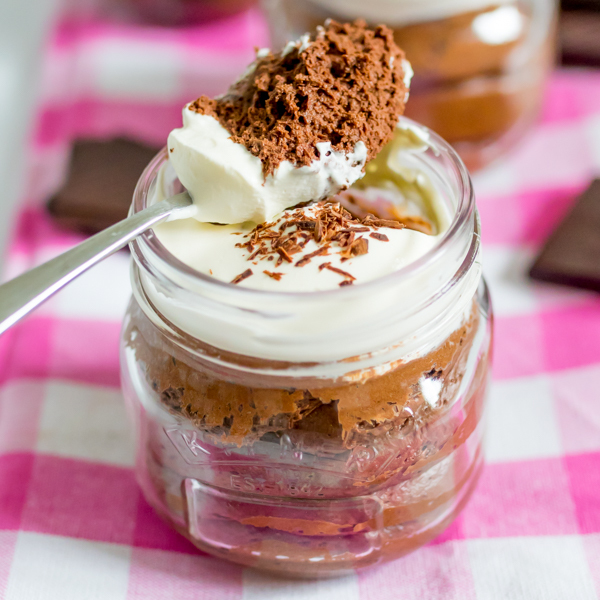 A rich and luxurious chocolate mousse, topped with whipped cream and chocolate shavings. 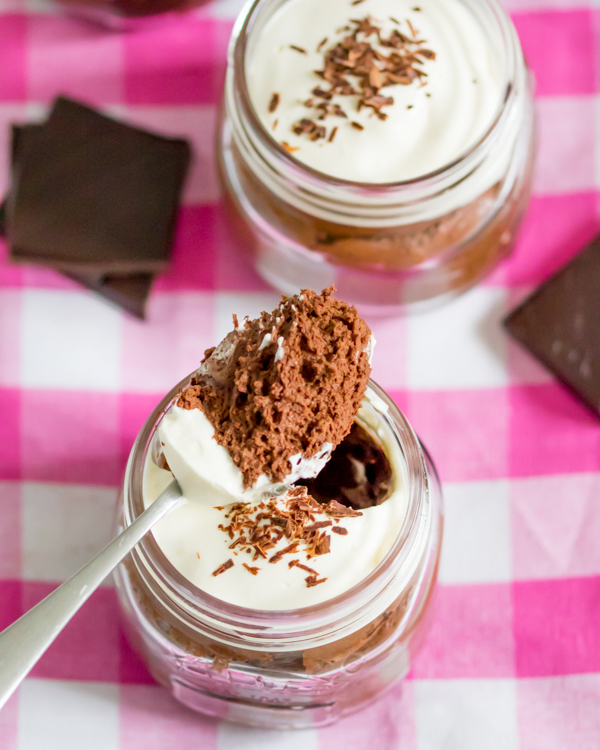 This chocolate mousse is a beautifully rich dessert to finish off a family meal. Made with dark chocolate and a tiny bit of instant coffee – to add extra depth and flavor – it’ll satisfy any chocolate craving. 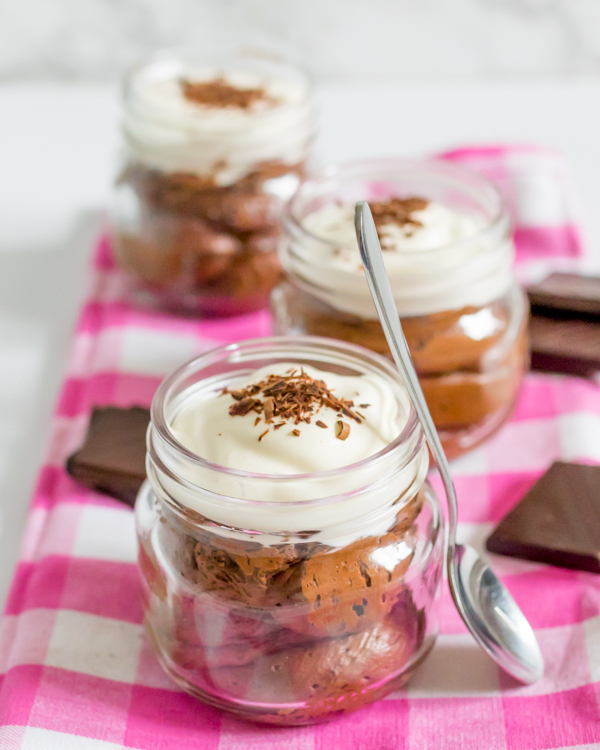 I love to serve this delicious pud in little glasses or mini kilner jars topped with very lightly whipped cream. 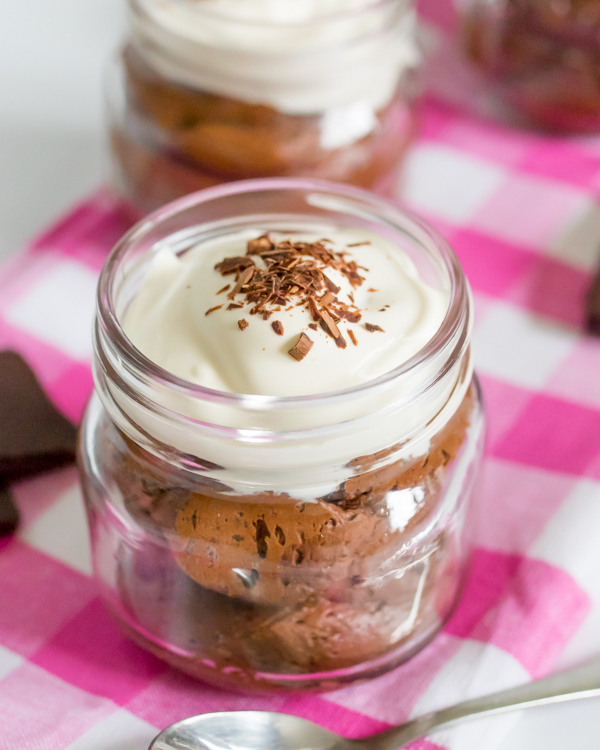 It can be a little messy to spoon the mousse into the glasses, so if you prefer, you can use a piping bag with a large hole (if the hole is too small, you’ll end up squeezing the air out of the mousse, making it dense). Serve with chocolate shavings, or you could even drizzle on some caramel, or top with fresh berries. Place the chocolate and coffee granules in a bowl and place over a pan of gently simmering water (ensuring the bowl doesn’t touch the water). Melt the chocolate, stirring every so often until the chocolate has melted. Turn off the heat, and take the bowl off the water. Leave to cool for 5 minutes. Stir the butter into the chocolate, then stir in the egg yolks one at a time, working quickly, using a wooden spoon until combined. Allow to cool for another 10 minutes. Whisk the egg whites and sugar together in a large bowl until they reach the soft peaks stage. Add the egg whites and half of the whipped cream, along with a pinch of salt to the chocolate mixture and fold to combine. Divide the mixture between 6 small or 3 large glasses or jars. Top with the remaining whipped cream and sprinkle with chocolate shavings before serving. Serve immediately, or cover and refrigerate up to a day ahead (the mousse will firm up in the fridge, but it still tastes delicious).